Some local government units already announced cancelation of classes due to expected heavy rains. MANILA, Philippines (UPDATED June 11, 11:23 a.m.)— A number of local government units announced the suspension of classes in all levels on June 11, Monday, in anticipation of bad weather caused by habagat, the southwest monsoon. Quezon City Mayor Herbert Bautista and Malabon City Mayor Lenlen Oreta were among the first to cancel classes for Monday. Bautista said the suspension of work in public and private schools depends on their respective administrators. 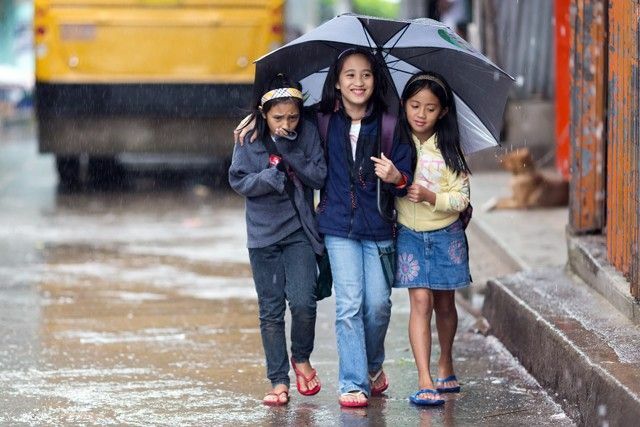 The state weather bureau said Typhoon Domeng left the Philippine Area of Responsibility on Sunday morning. However, the typhoon enhanced the southwest monsoon, which will bring rains across the country until early next week.